For those who love luxury and in search of new labels to satisfy their fancy – you are in luck, because Diogo Miranda has arrived to Paris! On March 8th, 2015, Diogo Miranda presented his collection, named Paris No 1, for the first time in Paris. Diogo Miranda is a Portuguese designer that debuted his label at Portugal Fashion, in 2007. He attributes his love for fashion to his mother and older sister, who are fierce fashionistas. His first show, at the Paris Fashion Week, took place in a beautiful room at the Bibliothèque National de France. The collection’s name, Paris No 1 was premeditated, as Paris was the inspiration for the autumn-winter 15/16 Ready-to-Wear collection. 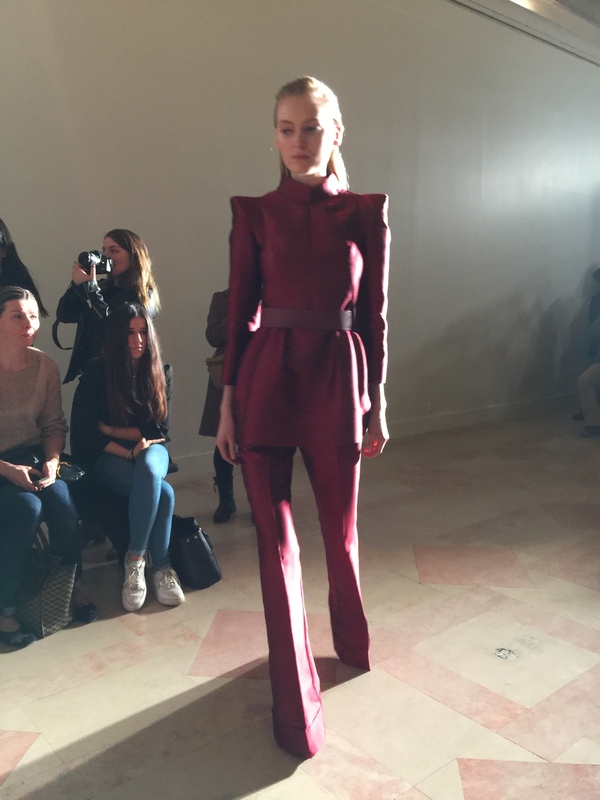 Miranda is a big fun of architecture and it is very present in his collection, the garments were structured in their cut, sharp futuristic shoulders, longer sleeves, tiny waists, prominent hips to outline the body. I asked Monsieur Miranda about the inspiration behind this collection, he said it was the image of a “Very chick, international girl who lives in Paris, very austere but sophisticated”, he also pointed out that he wanted to keep the airy like, feminine feel to the garments. The collection did have a romantic and elegant feel to it, thanks to silk and mikado fabric, that was presented in navy blue, black, blue riviera, deep red, and grey that all play on the mood of romantic femininity in the fall.